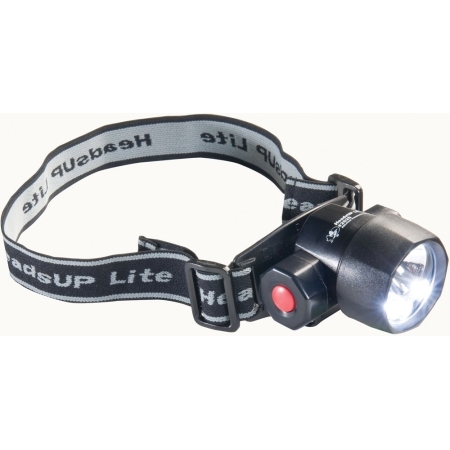 The Pelican HeadsUp Lite 2620 is a hybrid LED/Xenon headlamp. You have the option of using the Xenon lamp for an intense 14 lumen bright light or using 3 LEDs for a 9 lumen light which conserves battery life. When using the high-intensity light up to 3 hours of run time is available. When using the low-intensity light up to 80 hours of run time is available. This non-glare black headlamp features a pivoting head that allows you to aim the light where you need it most. An adjustable cloth strap and rubber strap are included. The Pelican HeadsUp Lite 2620 is powered by 3 AAA alkaline cells. Copyright 2018 Ocean Bargains. All Rights Reserved.